Looming onto the television horror landscape in October 2011, a new drama known simply as American Horror Story gave its eager viewers a lurid and graphic weekly dose of psychological unease and gruesome violence. Embracing recognized horror conventions of spooky settings, unnerving events and terrifying monsters, series co-creators Ryan Murphy and Brad Falchuk employ shocking visual effects and a distinctive anthology format to ensure their show continues to provide a contemporary TV take on the horror genre. As the first book-length study of American Horror Story, this collection examines the contribution that this franchise has made to small screen horror. 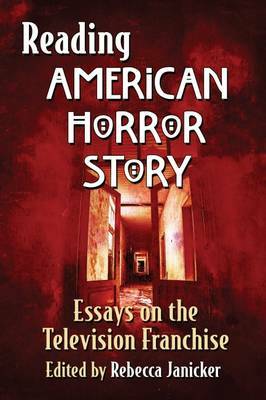 In a range of scholarly essays, contributors offer insights pertaining to three main areas - the entertainment industry, issues of representation and the horror genre - pinpointing ways in which the show speaks to social concerns, taps into classic horror tropes and offers up a twenty-first-century version of the tale of terror. "American Horror Story, FX's hit anthology series, has captured the imagination of viewers with its intriguing tales, quality writing, and noble actors.... [T]his collection explores the shows literary themes and social issues...as well as how series creators Ryan Murphy and Brad Fulchuk use familiar horror tropes in innovative ways." --Library Journal.